That’s how Archbishop Joseph W. Tobin described the six men he ordained to the priesthood on June 25 at SS. Peter and Paul Cathedral in Indianapolis during the Church’s Holy Year of Mercy. 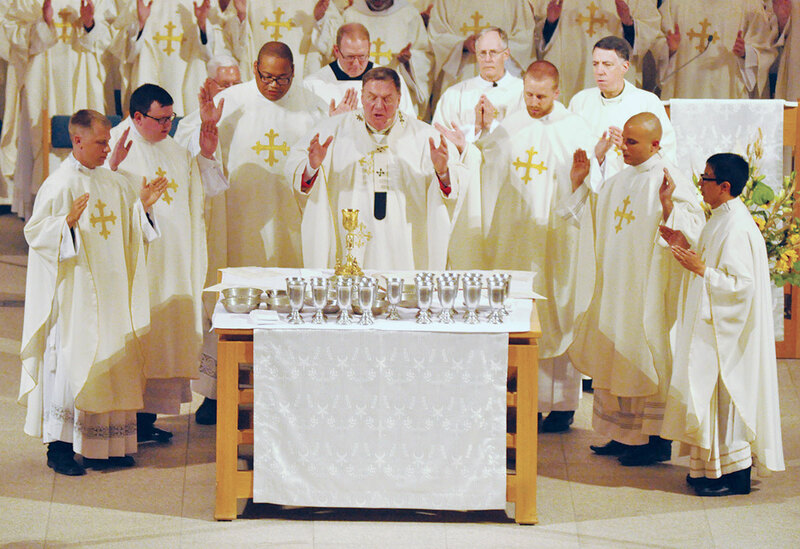 It was the largest number of men who were ordained priests for the Church in central and southern Indiana since 2002 when eight men were ordained. This year’s class members are Fathers James Brockmeier, Anthony Hollowell, Douglas Hunter, Kyle Rodden, Matthew Tucci and Nicolás Ajpacajá Tzoc. Moments before he ordained them, Archbishop Tobin reflected on the connection between the Year of Mercy and the ordination. He later reflected on three questions that Pope Francis put to thousands of priests in St. Peter’s Square a few weeks ago during a special jubilee for priests during the Year of Mercy. Where is the heart of a priest? Where is the joy of a priest? And what is the identity of a priest? Archbishop Tobin said a priest’s heart “knows only two directions: the Lord and his people.” It is intent on prayer leading to an ever closer relationship with Christ and intimate service to God’s people. 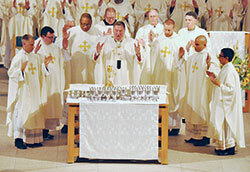 Archbishop Tobin finally reflected on the identity of a priest. He noted that it is found in the celebration of the Eucharist. After the Mass, the newly ordained priests reflected on these questions about the priesthood and being ordained in the Year of Mercy. Father Hollowell described after the Mass how he gained a new appreciation of God’s mercy while in prayer the night before the ordination. Father Tucci recalled being given a clear reminder of the tie between his priestly identity and the Eucharist when processing into the cathedral at the start of the Mass and seeing the altar before him. Later in the ordination Mass, the newly ordained priests were ritually handed a chalice and paten, symbolic of the vessels they will use at every Eucharist. It was an emotional moment for Father Tucci. One of the most dramatic moments of the ordination Mass was when the six transitional deacons lay prostrate on the floor of the cathedral while they and the congregation of nearly 1,000, including more than 100 priests, prayed the Litany of the Saints. It was an expression of the Church’s timeless belief in the communion of the saints, which holds that all believers stretched across space and time are one in Christ. Father Ajpacajá experienced this connection in a poignant way, since none of his relatives from Guatemala were able to attend his ordination. A few feet away, Father Hunter shared similar emotions since both of his parents are deceased. They were in his heart and mind “through the whole Mass,” he said. Two of his aunts were present at the Mass, including Nona Dottery, a member of St. Monica Parish in Indianapolis. Father Hunter has shared much joy over the years with his ordination classmates. Michelle Tucci was grateful for the deep relationships that her son shares with so many priests. Father Rodden knows well the importance of his brother priests, especially his classmates. The support extends beyond the newly ordained priests to their families. Don Brockmeier, father of Father James Brockmeier, said the prostration was an “emotionally intense” moment and gave him a keen awareness of “the seriousness, thoroughness and completeness of the sacrifice” that his son and his classmates were making. “That’s when it became real,” Don Brockmeier said. Father Tucci was brimming with joy after the ordination, looking forward to carrying out the mission God has given him and his five ordination classmates.